If like most businesses you are time poor and work heavy, any tools or tips to maximise productivity are always greatly received. 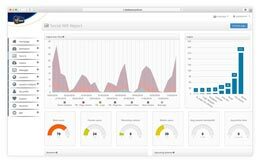 With SO WIFI from Evoke, you can automate much of the above marketing activity by using the SO WIFI Dashboard. Whether you’re a small business or a large nightclub, a betting shop or a shopping centre, a small bed & breakfast or a large hotel chain, just a couple of clicks allows you to build and drive professional marketing communications to all of your customer base, relevant to their likes and interests. By offering your customer free Wifi, you can build a detailed database of contact information which includes a comprehensive profile of their likes and interests, allowing you to create highly targeted promotions. Facebook user points of interest. For example music, TV, sport, culture, fashion and politics. If you would like a quotation for SO WIFI straight away as you can’t wait to see your business levels increase, please email sales@evoketelecom.com or call a member of the team on 01509 278278. If you would like to see a demo of SO WIFI and how it can help increase your business, please email sales@evoketelecom.com or call a member of the team on 01509 278278. In most cases your business can be covered by just one SO WIFI router but there is the option to purchase multiple routers for larger areas or multi floors. If you already have Wifi from an alternative provider, don’t worry – you can keep your current Wifi and simply plug in your SO WIFI router into your existing solution. Speak to the Evoke team for more details.